FLW STREN SERIES CHAMPIONSHIP NOVEMBER 5-7 2009 PICKWICK LAKE FLORENCE ALABAMA: After 4 qualifying events the top 40 Pro and Co-anglers from each of the 5 national divisions are invited to attend the championship. This year's event is held at Pickwick and Wilson Lakes. 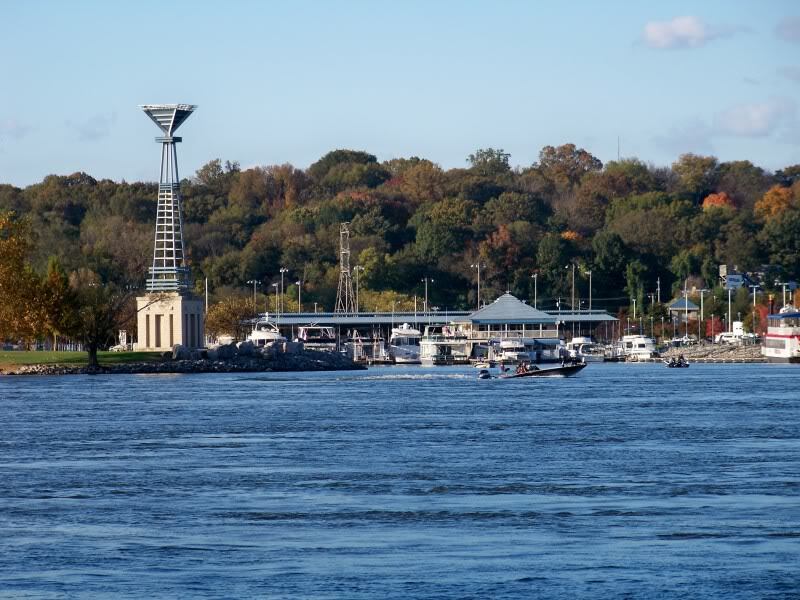 The host is the City of Florence and McFarland Park Marina. Florence is located in Northwest Alabama. FLW STREN SERIES CHAMPIONSHIP NOVEMBER 5-7 2009 PICKWICK LAKE FLORENCE ALABAMA: After 4 qualifying events the top 40 Pro and Co-anglers from each of the 5 national divisions are invited to attend the championship. This year's event is held at Pickwick and Wilson Lakes. The host is the City of Florence and McFarland Park Marina. Florence is located in Northwest Alabama. 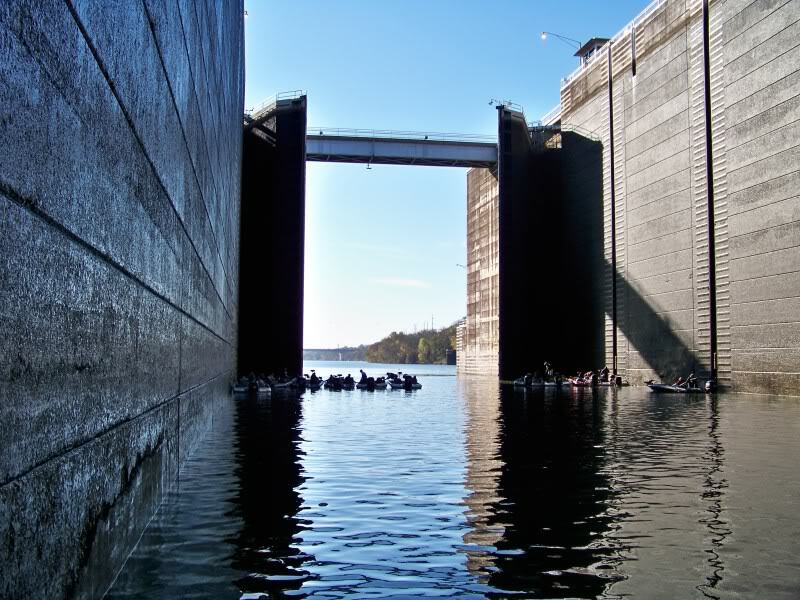 Created by a series of dams, Pickwick and Wilson Lakes are located on the Tennessee River. 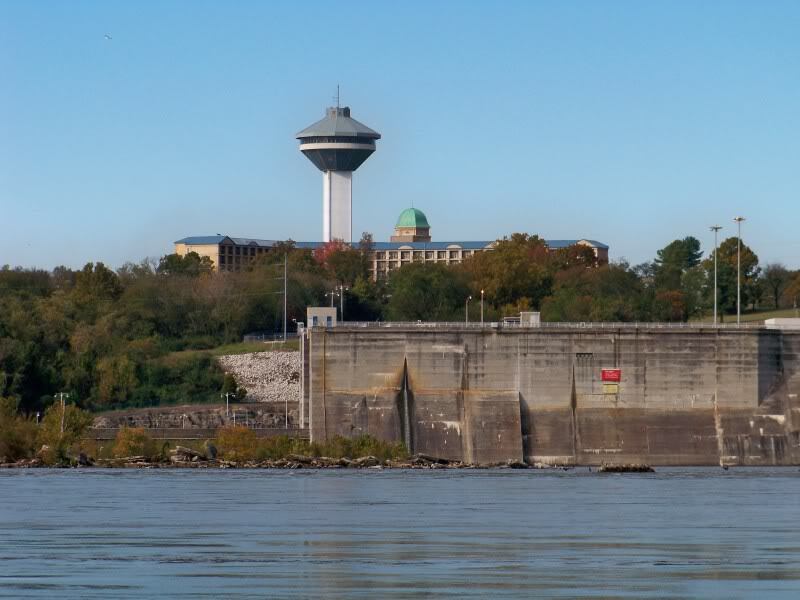 Pickwick water flows through 3 states Tennessee, Mississippi, and Alabama. In a few short years the bite at Pickwick has dramatically improved . Comparing tournament results, the winning weights have nearly doubled. In 2005 the Stren Championship (then named the EverStart Series) was won with a 4 day total weight of 37 pounds 12 ounces. During a Stren event in June of 2008 the winner reeled in a 4 day total weight of 73 pounds 13 ounces. 2nd and 3rd place weighed 71 pounds 8 ounces and 70 pounds 8 ounces. Local touring pro's credit the recent proliferation of aquatic vegetation as a major factor for the upswing of this bass fishery. Everywhere I fished here you would observe an abundance of bait fish, usually relating directly to the marine flora. This gives further credence to my statements of why the California Delta is such an awesome tidal bass habitat, aquatic plants. 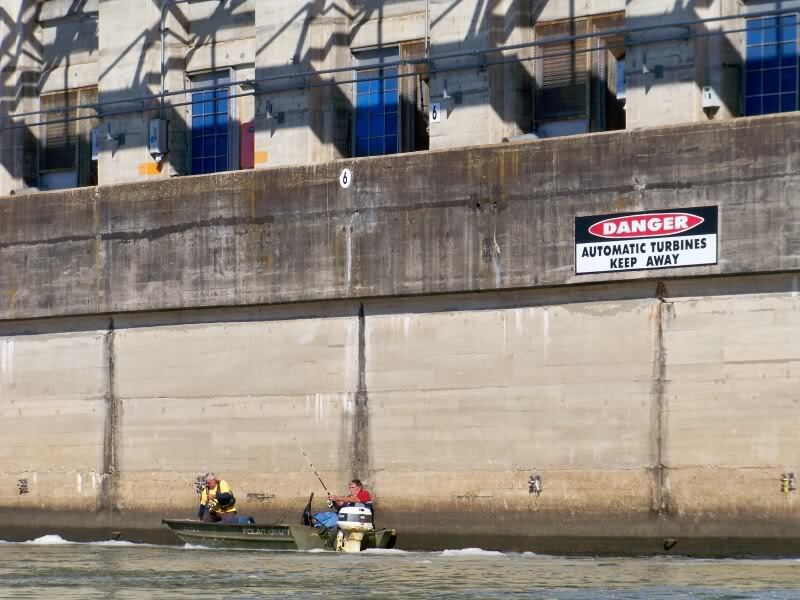 Pickwick also has the reputation as being one of the best trophy smallmouth bass locations in the country. A unique set of conditions exist here. 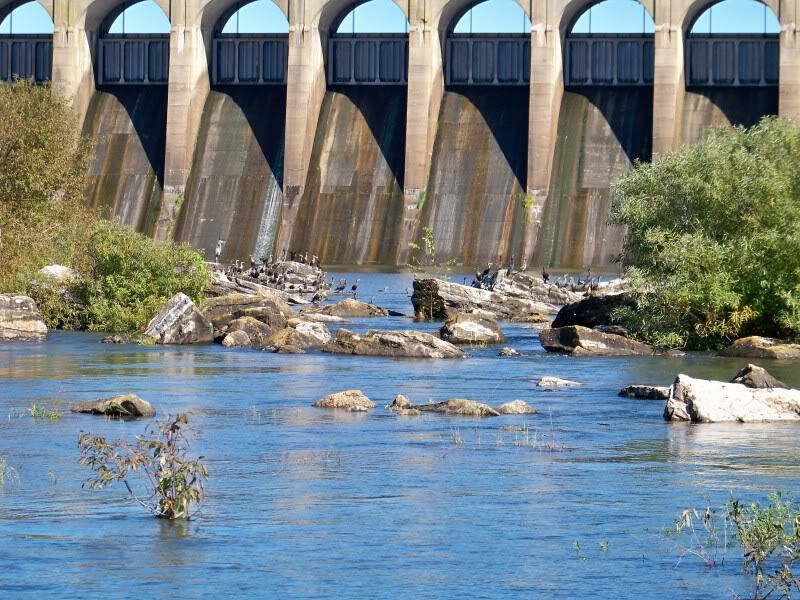 The dams produce strong current situations. Smallmouth anglers know that current and bronze backs are never far apart. This lake is positioned at the southern extent of the geographical distribution range of smallies, resulting in a longer growing season. 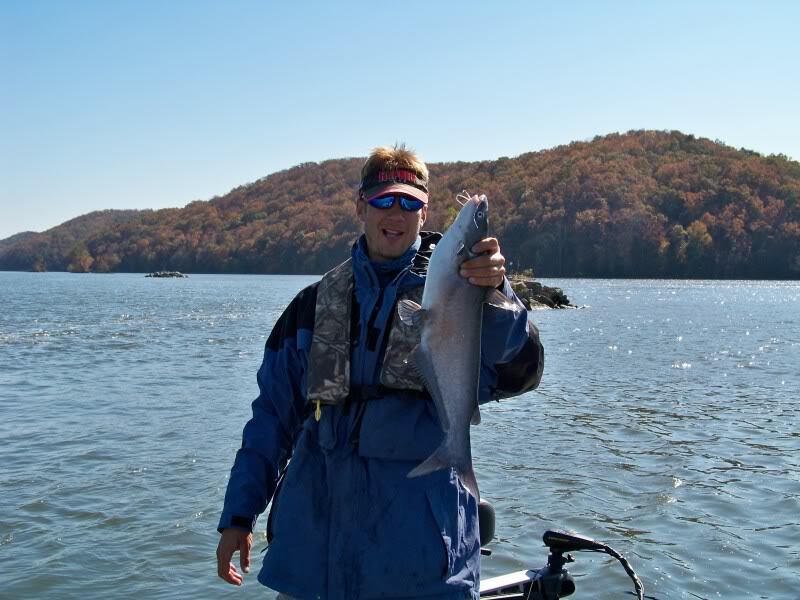 Current, ample food supply, a longer growing season and the smallmouth are going to get big. Here is a 4 pound smallie. As a pro you will need 5 of these a day to be in contention. I witnessed local anglers in a 1 day team event boat 5 and 6 pound smallmouth. This photo fish and the team event smallmouth came from fast current just below the Wilson Dam. GPS showed us moving on the drift at over 6 MPH. Pickwick smallmouth bass are large and strong. 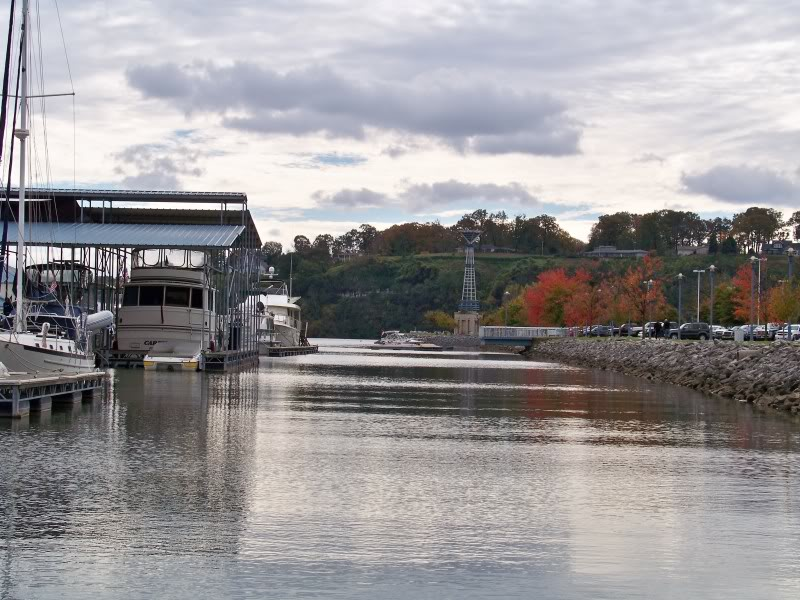 What does Pickwick have to offer? Wherever you go here you are not far from a bluff wall. This rock pile is actually a high spot along a ridge line that runs for miles. Most ridge lines here are very long, not obvious, and way off from the shore line. Not to be confused with a turn in a bluff wall, the points here are also subtle. They are not as pronounced as what most of us see in western canyon reservoirs. Flats usually feature abundant vegetation. Out in the center of the main channel, a flat covered with weeds surrounding Kroger's Island on Pickwick. Among other places, humps can be located along the bottom in the main river channel. You can graph them and see nice marks on them. With strong current they are not easy to hold on and target. Feeder creeks have all 5 structure types and a variety of cover elements. Be sure to check out where the muddy water meets clean water at the convergence of the creek and the main river. and a shallow weed covered flat on the opposite side. Rip rap has been placed along the shore as an erosion control method of protecting banks. A flat with weeds and current break and eddies will typically be adjacent to the rip rap. Be sure to check out where rip rap, a flat, and a bluff wall meet. A waterfall above the rip rap. Small docks at Doublehead Resort on Wilson Lake. Docks at Town Creek Cove, Wilson Lake. Moorings in front of an old railroad bridge. 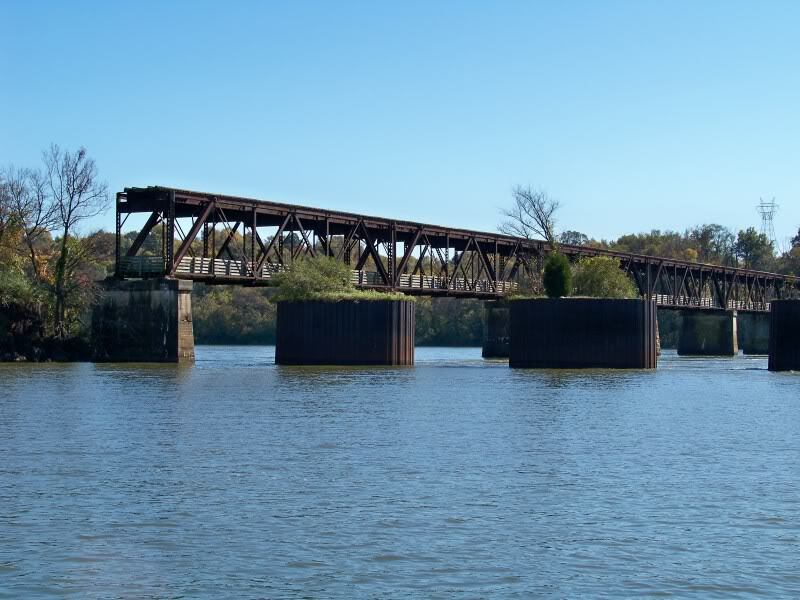 A section of the railroad bridge has been removed after the creation of Pickwick Lake to accommodate barge traffic. The bridge has been converted to a scenic pedestrian walkway. The weeds will have abundant forage fish. There are two conditions that deserve investigation. Vast expanses of solid weed coverage growing in shallow water. The weeds will create a blanket that covers the bottom and middle of the water column leaving 1 to 3 feet of water, the top of the water column targetable. Also the edges of weed lines that grow to the waters surface. Wood lay downs are throughout the system. They generally will hold largemouth, especially in the creeks. Anchored barges, fish the up current side of the barge. 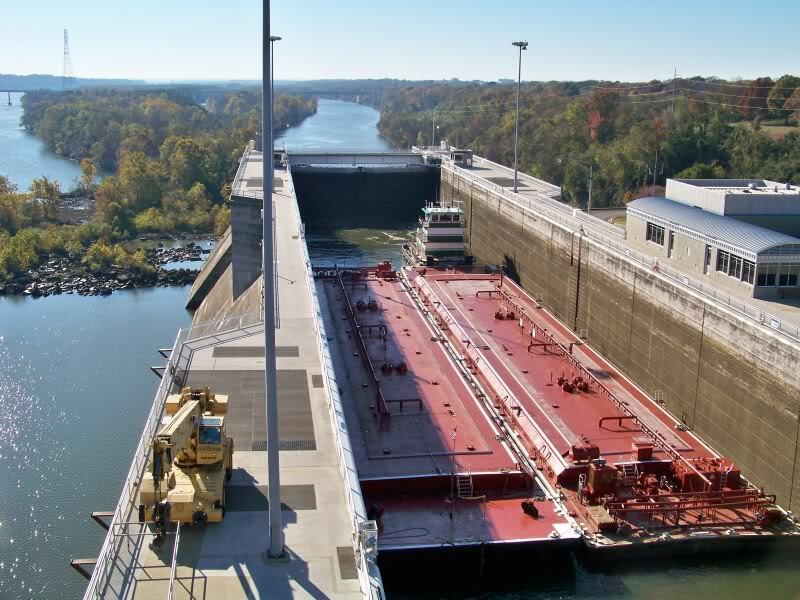 The barge will displace water at the upstream end. 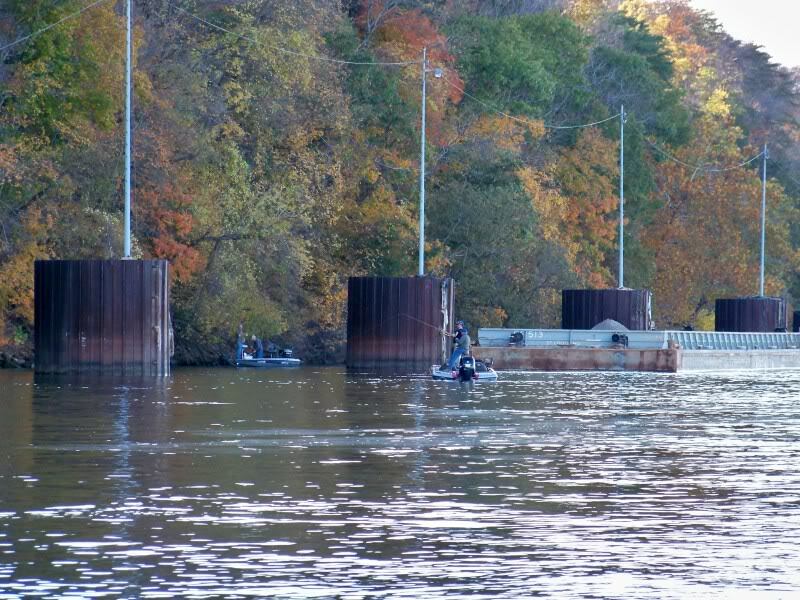 Presumably the bass will hold under the barge just behind the current break waiting for food to come to them. When your lure hits the current break they jump on it. Look closely, do you see him? No this guy is not sinking. The fast current coming off the dam is actually a couple feet higher than the surrounding lake surface. Here is a description of the techniques and the associated water Troy and I used successfully during practice and the tournament. Lures beyond what are shown below produced for us, but I am showing the ones that achieved repeated catches of bass. The Wiggle Wart, a small crank bait imitating bait fish. Born in the Ozarks this bait has a unique action. The line ties to a snap instead of a split ring. This bait has a crazy track, first running to the left and then suddenly to the right, up and then back down. Profile and action; in the creeks and the main river, bass and other species could not resist. Locations; anywhere except where it hangs in the weeds. This lure shined in the creeks around rocks, bluff walls, wood lay downs, and the edge of weed lines. Take more than one with you, a long nose-gar just might take it away. Spinner Baits, imitating a small school of bait fish this bait would produce in the same places as the Wiggle Wart. It was also effective over weed covered flats where the crank bait would hang up. 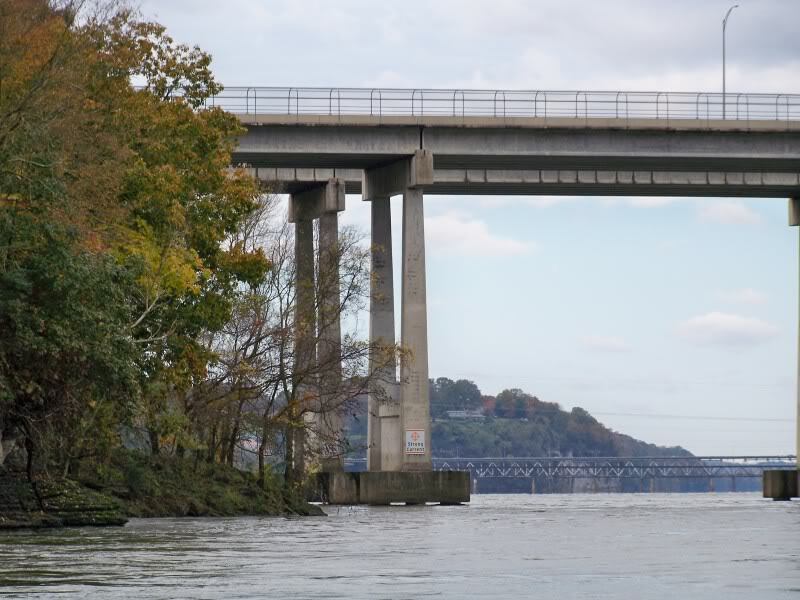 Use a lighter model in this situation as to keep the lure high in the water column over the weeds or when the bass are pushing small bait up at the top of the water column against the bluff walls. We often talk about color here at the BBZ. In some places you would find relatively clear water and in most places highly stained water. I looked at the bait fish and did not see any chartreuse forage. I decided to throw a white skirt with silver blades in both clear and muddy water conditions and it produced wherever I threw it. While at Pickwick I listened to many anglers referencing chartreuse skirt colors and gold blades, this was an additional influence in my blade pattern selection. I wanted to show the bass something different from the other anglers. 3" Grub single tail rigged on a exposed hook jig head. Swimming in current and a pendulum swing paralleling bluff walls, manmade structure, and manmade cover. The spotted bass favored this presentation when fishing the bluffs. Foo-G this one is for you, the Scrounger. On drift patterns and presentations in the strong current most baits would hang up immediately. The scrounger proved different. Rigged with a Super Fluke, the collar just like the lip on a crank bait, would allow this lure to flip over the hang ups. I especially liked this bait drifted down the bottom of the seam between the fast water and the slack/eddy water. This bait produced my best bites. It also scored when cast upstream and retrieved with the current over the top of ridge lines. I used a 1/4 ounce long bill model with a Super Fluke trailer when fishing deep or fast. A 3/16 ounce long bill model with a variety of small plastic shad imitations was employed when fishing high in the water column, targeting bass that were working small bait fish against bluff walls. Top water, the Zoom Super Fluke nose hooked with braid line on spinning gear. This was my best boiling fish lure. Cast blind when the bass are not busting, but I prefer to wait for a boil with the spinning reel bail open ready for a quick cast. When a bass busts on top immediately cast just beyond the boil and twitch the bait back to the fish. If you can tell which way the fish is going, lead the fish so the lure intercepts the movement of the bass. 8lb. Braid and spinning gear and you can cast this bait very far. I use a fast tipped rod, it aids with the cast and compensates for the no stretch of the braid. My day 1 pro was using the same bait with mono and bait casting equipment. I was able to reach the same targets he could but I was further away from the targets in the back of the boat. A big plus for a co-angler. Latter in the day the top water action died. The pro stayed in the area and was doing well with a suspending shallow diving jerk bait. Using the same technique as a pro when you are on a flat in open water and you can cast 360 degrees is much different than going down a bank fishing the pro's used water. Without a jerk bait, D'oh!, in my bag I placed a nail weight into the head of the fluke. This allowed the Fluke to sink faster where I could work it subsurface. The nail weight also enabled me to cast even further, another plus and a good move as it filled my limit. Zoom Magnum Trick and Magnum Shaky Head Worm, rigged on a 1/4 ounce pro model Spot Remover. Imitating a worm or small eel this technique is my 'Co-Angler' tip of the trip. Day two I had 5 bites and put all 5 in the boat. My day 2 pro was working bluff walls with a spinner bait. He hit every angle sometimes two, three, four times. I knew it was not likely that I would catch a reaction fish behind this guy. Moving upstream he was working the top and middle of the water column. That left me the bottom. Watching the pro closely I targeted the areas between his casts as well as away from the bluff wall. Casting into the current I would shake on slightly slack line to produce subtle movement and then move the lure on tight line. Paying very close attention was critical as most of the bites I did not feel. Watching the line as it would jump or move up current was the only indication of a strike. 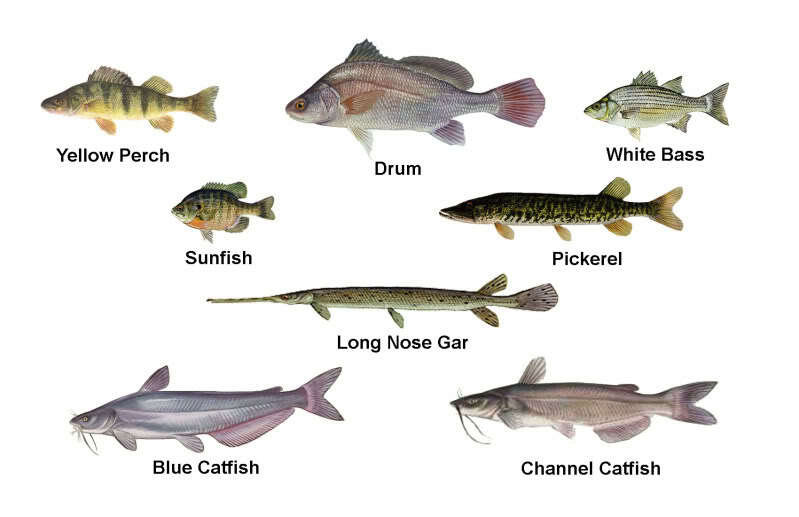 This river system is home to a variety of fish species. While targeting bass using bass baits Troy and I caught several different types of fish. In one day alone we caught 7 different species. The following pictures represent the species we caught. The variety of fish here is not limited to these images. Nice largemouth, duped by a scrounger this largemouth bass was out in the main current where we caught other smallmouth. This small Pickerel/Pike destroyed my spinner bait, it is now an in-line spinner. I witnessed 4 types of bait fish; threadfin shad in the 3" range, skipjack shad/skipjack herring around 9"+, gizzard shad 6", and small minnow type baitfish 1' to 2". The opportunities to observe bait were numerous. Here are a couple of shots. While reviewing the images of bait the camera captured one school of shad with an unexpected result. This photo has not been altered or modified. 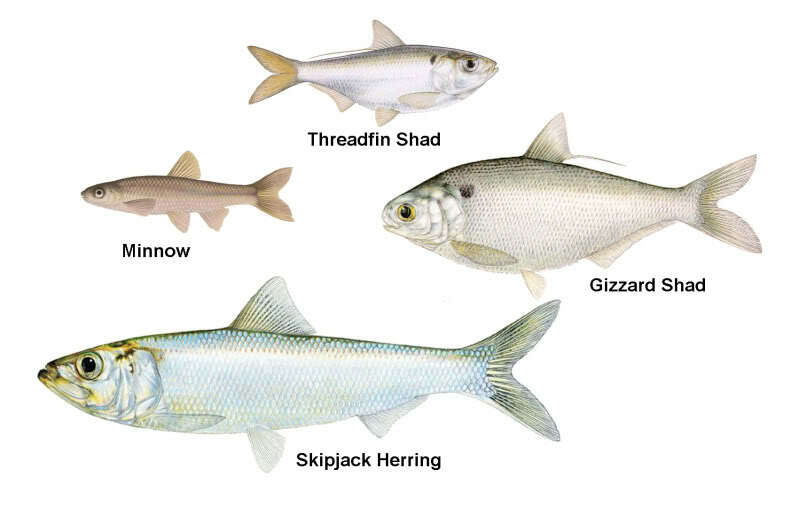 The image shows these threadfin shad (notice the black spot on the side of the fish behind the head) in a cartoonish manner. Their bodies appear wiggly and worm like, the eyes appear to be bulging from their heads very exaggerated, and their mouths when viewed head on and open are red. Two things came to mind when seeing this. 1, if the camera sees this then probably so do the bass. 2, lure manufactures must be aware of this also. So many baits, especially cranks feature bulging oversized eyes and a red mouth area. Good spot to rig rods. Try if you can to listen to the lakes pulse, rhythms, her mood and then put yourself in the same tempo. Local team tournament on Pickwick, Wilson Dam beyond. The upstream boat is in front of a bluff wall (bluff out of view). 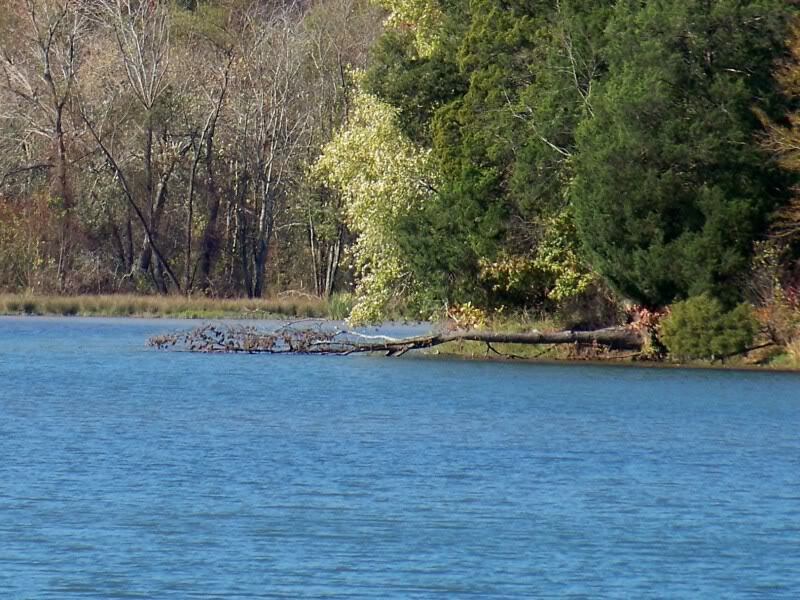 The downstream boat is adjacent a point. Both are in fast current. There is an eddy where the bluff meets the point. In this photo you can see current seams. Find yourself on the bluffs and you are being back seated, target the seams on the outside. The 360 Grill restaurant, the outer section of this restaurant rotates providing a 360 degree view of the area. Day 1 patchy fog but a green light. At the docks and then to the scales. Day 2 heavy fog and a red light. After a 75 minute delay the sun burns off the fog and they let us go. 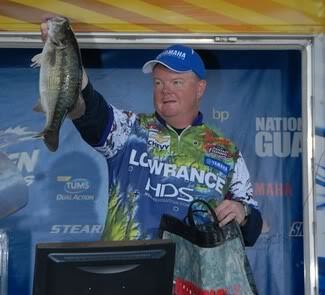 Top 10 final day pro flips the shoreline in Town Creek Cove on Wilson Lake. I was not pleased with one of my draws. After the weigh in I asked him to step away from the crowd, telling him that I had to explain something and I did not want others to hear us. We had our discussion and I feel he is much more 'down to earth' now. We all have heard of 'Dock Talk'. At the Cal Delta I showed you what I call 'Tulle Talk'. And here is what I call 'Lock Talk'. Avoid all three. I was impressed with the pro I drew this day. He stayed away from the crowd; tying up apart from everyone, avoiding distraction, providing the ability to focus and concentrate on the task at hand. You do not want to be in the way behind these doors when they open. Time still remains, back to work on Pickwick. Mark Rose the Arkansas pro lead this event wire to wire. During practice I watched tournament anglers stack up on community holes. I also watched this pressure have its predictable effect come competition time. If you listen to Rose's technique description on how he caught his fish you will notice that it was basically the same thing many anglers were using at the community holes. Rose separated himself from the pack by literally separating himself from the pack. 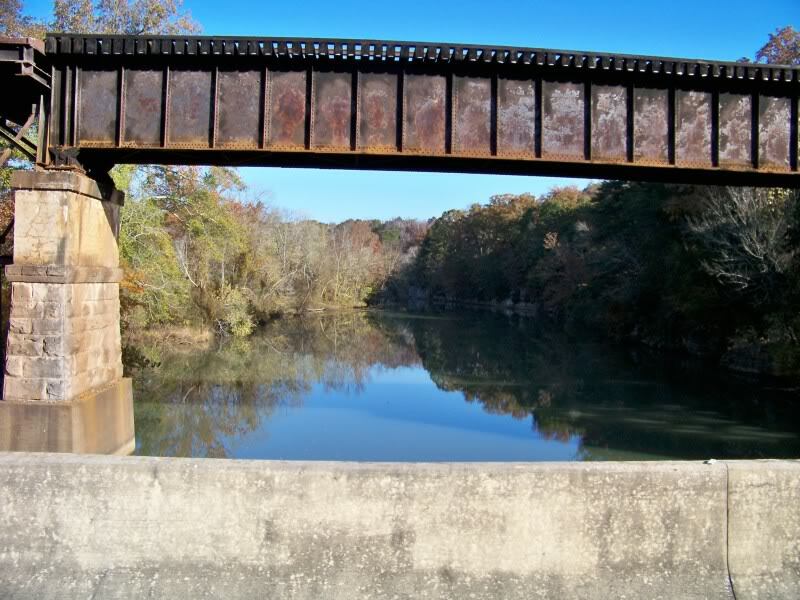 He made a near 80 mile run each day to Bay Springs Lake in Mississippi. 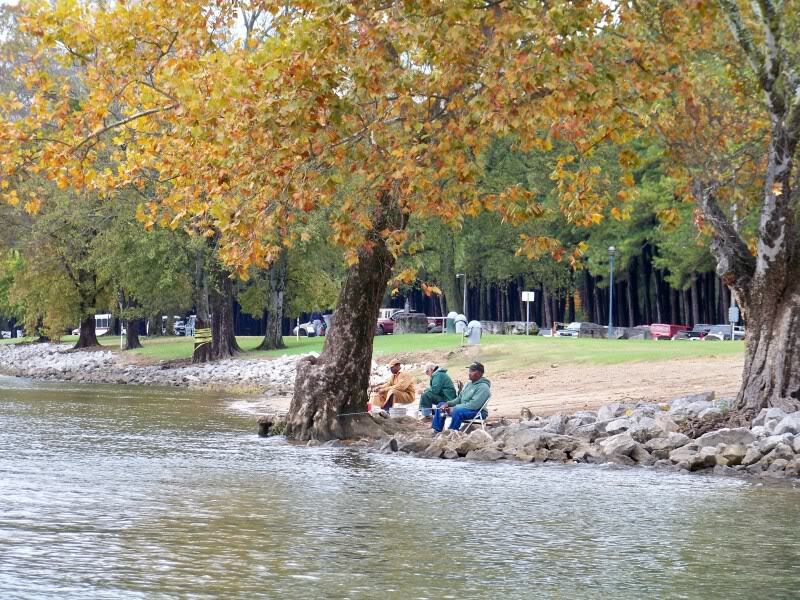 Bay Springs is a smaller clear water lake connected to Pickwick by the Tombigbee waterway. There he targeted large spotted bass moving up shallow to feed by presenting a suspending jerk bait. 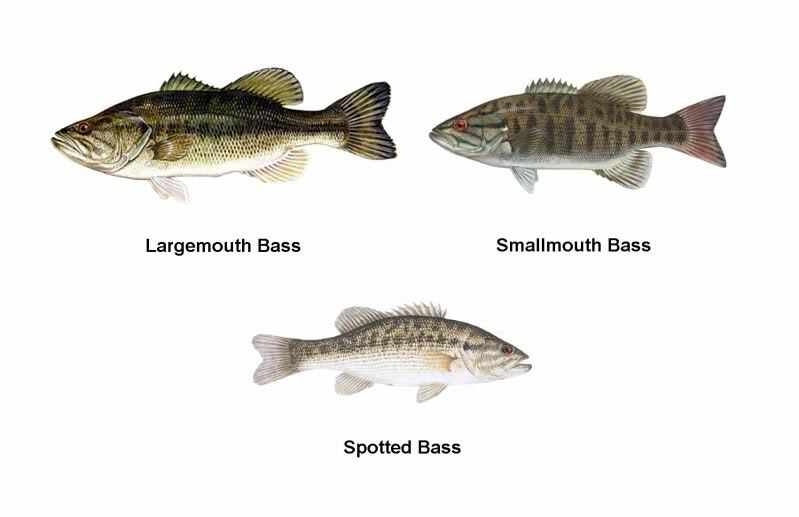 Mark stated that the pattern suited the habits of spotted bass when the water begins to cool late in the year. Assisted by a light breeze and his plan worked brilliantly. Rose has a record of success on Pickwick. Knowledge; of the lake, of the bass, and the present conditions producing confidence. Knowledge and confidence a winning combination. This was my first full season fishing the Stren Series. I have seen and learned much. I want to thank Troy for encouraging me to fish these events and for the ability to travel together. I am not sure I would have done this on my own. Troy's support has been responsible for my accomplishments just as much as any factor. Thank you very much Troy. It was a real treat to visit and fish this place. The water in some ways is very different from what I usually experience in the west, but that is what I want. 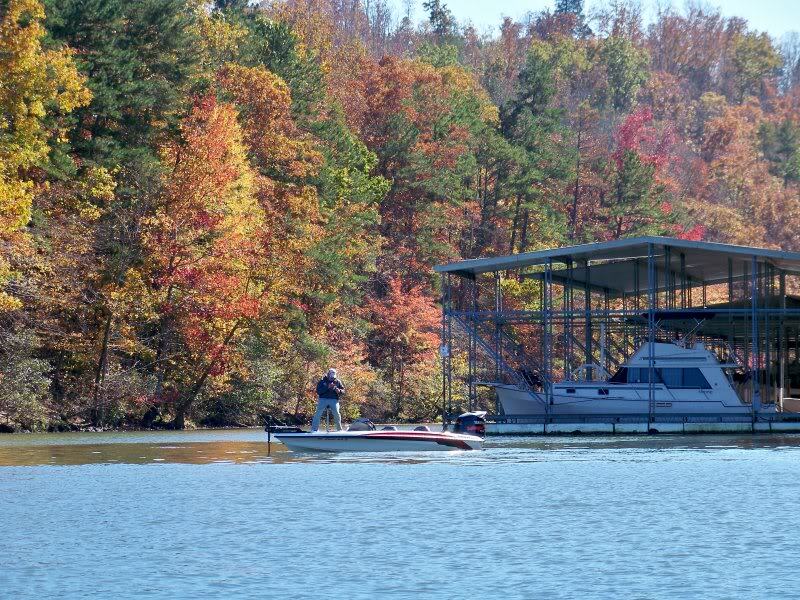 I travel the FLW because it takes me to different water. I was also very happy to draw the pro angler of the year from the Northern Division and a extremely accomplished pro from North Carolina. It was a learning experience to watch these two anglers execute during this tournament. The FLW Stren Series has dropped the western region for 2010. A sign of these tough economic times. Time will tell if Stren will return to the west. Whether they come back or not; regardless of what happens, I am wishing each and every one of you, each business, each community, our nation, a better, a prosperous 2010. Good luck to all of you.